I love the idea of punching up a simple top with a variety of jewelry, and the mix here is spot-on perfect. I'd recreate this look with these silver bangles, this blingy crystal bracelet, this colorful woven band, and this pearl and leather cuff. Then I'd throw on this beaded chain long necklace to finish things off. 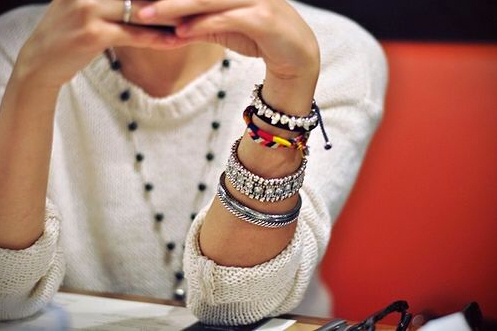 That looks like the wrist of one of the stylish women I saw in Milan last week! It's a great way to pick up a simple outfit. great way to add color to all the white we're wearing this summer!